Cedar Nut Oil: What beneficial properties does it possess? Many of us have tasted delicious Cedar nuts. But these nuts are not only delicious, but extremely wholesome. When scientists embarked on the serious study of the composition of Cedar nuts, they were literally shocked, since they could not have even imagined anything like this. It turned out that Cedar nut kernels contain more protein than in many types of meat. Moreover, the protein from the Cedar nut is assimilated by the body almost completely, which is also a great rarity. In addition, the nut contains almost all the amino acids, unsaturated fatty acids, and vitamins necessary for our body, as well as a wonderful collection of mineral substances and trace elements. For those who want to bring healthy progeny into the world, and then live long and be sick less, Cedar nuts are simply indispensable. They contain the entire set of antioxidants that promote the transmission of the full complement of hereditary material and slow down the body's aging process, including tocopherols (E group vitamins). It is not in vain that native Siberians, who were traditionally known for robust health and physical strength, always consumed large quantities of Cedar nuts. In Siberia, since ancient times, it was believed that precisely the Cedar nut was one of the chief riches of the taiga. Cedar forests were always protected. Entire villages went out to collect nuts, moreover the number of trees from which families were to gather the nuts was determined earlier, taking into account the quantity of family members to feed. Usually the nut harvest lasted five to ten days, for the cleaning of the cones (shelling) was done right in the taiga, using special devices. Unless "the community" consented otherwise, it was permitted to gather nuts only in distant Cedar forests, to which there were no roads. Many variants are known for the preparation of dishes using Cedar nut kernels, but, first and foremost, the nuts were stored for the production of Cedar nut oil. It was used not only in cooking, but also as an effective medicinal remedy. I will not tire the reader with figures, but only mention that the quantity of E group vitamins in Cedar nut oil is five times greater than in the famous olive oil, and the quantity of vitamin F is three times greater than in fish oil. The demand for high-quality Cedar nut oil was always high, as was its price. Unfortunately, there also existed the problem of counterfeiting the medicinal Cedar nut oil, or in its place providing oil intended only for culinary or technical purposes. The peculiarity lies in the fact that there exist several basic ways of obtaining Cedar nut oil: cold pressing, thermal or hot pressing, and extraction using various substances. In all these situations, externally, the oil obtained is practically indistinguishable - an amber yellow colour, with a slight, specific Cedar aroma and taste. But its medicinal properties are different. In cold pressing, the kernels, cleaned of their shells, are placed in a wooden press. The oil obtained settles or is filtered. During the processing, the oil is not permitted to come into contact with any metal parts. The Cedar nut oil thus obtained is extremely wholesome, and is widely used in traditional medicine and cosmetology. This method is the most costly, but the result is of the highest quality. Several thermal methods of obtaining Cedar nut oil exist. The most common involve separating the oil from the heated crushed kernels while rinsing with hot (boiling) water and hot pressing. This method is less expensive, but as a result is obtained simply high-quality, culinary Cedar nut oil, whose medicinal properties are one order of magnitude lower, since many of its wholesome substances are destroyed by high temperatures. To obtain Cedar nut oil, Korean pine nut kernels of the 2008 harvest were used, collected in the Jilin Province of China. Crushed kernels 1-2 mm in size were exhaustively extracted using diethyl ether in a Soxhlet apparatus over four to five hours. The ether was removed from the resulting extract by distillation in a vacuum, and Cedar nut oil was obtained with an average yield of 60% calculated on an initial raw material dried at a temperature of 55?C. 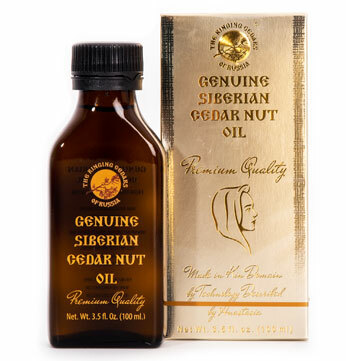 Some producers often refer to this type of "Cedar nut oil" as Cedar nut oil obtained by cold pressing. It is very cheap, but at the same time provides enormous profits to its distributors. This type of oil, of course, does not possess the medicinal properties of genuine Cedar oil obtained by cold pressing. Most often, Cedar nut oil obtained by the above method is produced in China and Europe, but lately, in the pursuit of profits, this type of oil has begun to be obtained in Siberia, Russia. Also in the pursuit of profits, Cedar nut oil is diluted with vegetable oils (corn oil, sunflower oil), from which their specific odors have been first removed. Without conducting a special analysis, only a few people are able to determine the production method of the oil solely by its appearance and taste. For that reason, it is advisable to be extremely cautious when buying Cedar nut oil. When purchasing from Internet stores or pharmacies, attention should be paid to the presence of authoritative studies made by scientists and medical specialists, since it does not pay producers to study Cedar nut oil produced by the hot pressing or extraction method. If the producer or the seller arouses any doubt, it is better to decline the purchase. To date, I am aware of only several producers of Cedar nut oil that sell their own products, including through the Internet. These are www.CedarNutOil.org and www.RingingCedarsofRussia.org. You will always find high quality Cedar nut oil and acceptable prices on these web sites. "Home" methods of verifying the authenticity of Cedar nut oil have long existed, but more often than not, they allow only imitations to be revealed. The problem is that oil obtained from both the cold and hot method, as well as extraction, "behaves" similarly in tests. 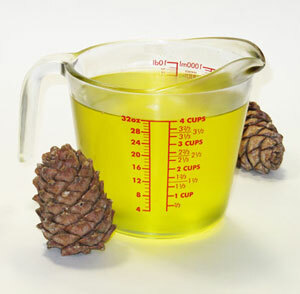 If Cedar nut oil is placed in the freezer section of a refrigerator, the oil obtained by cold pressing does not change, that obtained by the hot method or extraction may grow barely noticeably cloudy and begin to thicken (but not many people can distinguish these changes), while the changes in the imitation can be seen by anyone, they are so striking. The use of Cedar nut oil for medicinal and preventive purposes is simple. Usually one to two tablespoons are simply taken before eating. It is advisable to use it for the treatment of serious illnesses (oncological diseases, cardio-vascular diseases, diseases of the gastro-intestinal tract, diseases of the kidneys, liver, etc.) after consultation with a physician. Cedar nut oil has practically no contraindications, other than an extremely rare individual intolerance, but it is precisely a specialist who will be able to develop the most effective course of treatment. To treat catarrhal illnesses and nervous disorders, eliminate chronic fatigue syndrome, increase physical and intellectual ability to work, decrease the level of cholesterol, or strengthen immunity (the list may be continued at length), it is not complicated to draw up a course of treatment on one's own. And it is perfectly suitable for children's nutrition, it is especially recommended at the time of the loss of the baby teeth. Cedar nut oil may also be used externally. It possesses excellent wound-healing properties, it is good in helping to treat burns, frostbite, ulcers, and various skin diseases, it rejuvenates the skin and makes it supple and smooth, it helps to eliminate dandruff, combat brittleness and hair loss. By the way, Cedar nut oil is not contraindicated for people with oily skin, it nourishes it well and, as strange as it may seem, assists in the reduction of the oiliness. Genuine Cedar nut oil is rather expensive, but its medicinal properties compensate for the high price with interest, providing people with health and a wonderful sense of well-being.